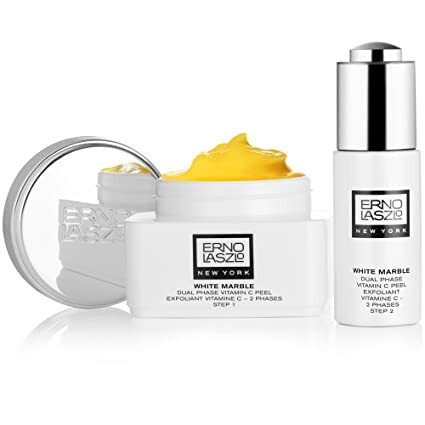 2833945 Erno Laszlo White Marble Dual Phase Vitamin C Peel, 2.4 fl. oz. Peel and reveal. Powered by super-nutrient Vitamin C, our clarifying two-step peel gently polishes skin as it fades dark spots and discoloration. Step 1 gently exfoliates; Step 2 activates brightening and moisturizing activesyou simply peel away to uncover instant radiance. Your complexion feels instantly new: smoother, even-toned and illuminated. Protective antioxidants and collagen-boosters combine to refine and renew skin. 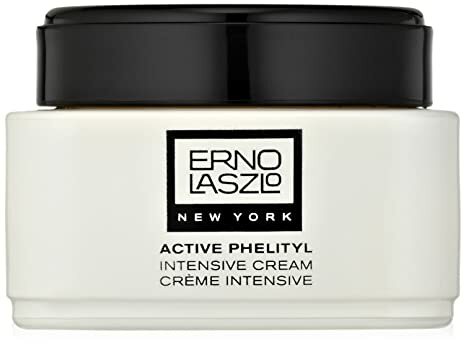 Erno Laszlo’s original, all-purpose 24-hour cream intensively protects your skin’s natural moisture around the clock, even in extreme weather conditions. Phelityl indicates Erno Laszlo’s unique moisturizing complex with a pH level nearly identical to that of the skin, which helps to maintain the fatty acids essential for skin function. 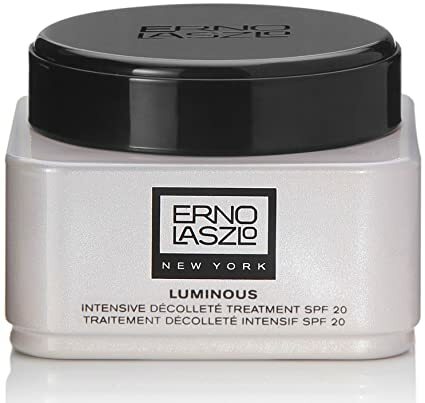 2815001US Erno Laszlo Luminous Intensive Décolleté Treatment SPF 20, 1.7 fl. oz. Illuminate your dcolletage to brighten, firm and protect from discoloration and photo-aging. This targeted formula with active botanicals zaps sun spots while it re-texturizes the entire chest area. Elasticity is reestablished, and broad-spectrum sunscreens protect this delicate skin. Repair and illuminate the delicate skin on the dcolletage with this protective treatment with SPF 20. Our treatment helps soften, firm and brighten the skin, while broad-spectrum UV protection guards against discoloration and photoaging. Promotes cell turnover to help even skin tone and diminish sun spots, age spots, and dark spots. Antioxidants and broad spectrum sunscreen protects against environmental damage. Soothing emollients soften and replenish skins moisture level. This lightweight formula seals in natural moisture overnight to plump your skin. Phelityl indicates Erno Laszlo’s unique moisturizing complex with a pH level nearly identical to that of the skin, which maintains the fatty acids essential for skin function. Prepare the skin for effective cleansing. Phelityl Pre-Cleansing Oil penetrates pores to dissolve trapped oils, impurities, and makeup on contact. When combined with a cleansing bar, this treatment oil creates a conditioning lather which improve the epidermal barrier and maximizes the cleansing process. Phelityl indicates Erno Laszlo’s unique moisturizing complex with a pH level nearly identical to that of the skin, which maintains the fatty acids essential for skin function. 2833949 Erno Laszlo Transphuse Day Serum, 1 fl. oz. Transform your skin with our quick fix dermal filler. Transphuse Day Serum dramatically improves the skin’s elasticity and plumpness, reducing the appearance of fine lines and wrinkles. This state-of-the-art formula contains gatuline expression which minimizes the micro-contractions in the skin to relax tense facial muscles and provide a smoother, noticibly younger appearance. Optical diffusers give skin an unpreendented glow. Marine filling spheres encourages collagen production to help plump fine lines and wrinkles. Instantly diminishes redness and ruddiness. 2039916 Erno Laszlo Shake-It Tinted Treatment, Neutral, 6.8 fl. oz. Shake-It Tinted Treatment is a shake-to-mix, duo-phase preparation. Control shine and even skin tone with a light, flawless tint. Shake-It Tinted Treatment uses exclusive toner with color technology to control surface oils, conceal blemishes and minimize the appearance of pores with a transparent hint of color. Locks in moisture and perfects your skin tone for a natural-looking matte finish. This alcohol-free skin toner leaves dry skin feeling refreshed. Alcohol-free formula gently respects your delicate dry skin, which can easily become dehydrated. Gently calm and hydrate to freshen your skin. 2844931 Erno Laszlo Timeless Skin Serum, 1.7 fl. oz. Repair, restore and protect your skin’s youthful vitality with a preventive preparation. See dramatic improvements in hydration, smoothness, elasticity, even tone and fine lines and wrinkles. Rebuilds cell integrity and strengthens skin structure with vitamin E while marine extracts stop collagen destruction for a super-firming effect. 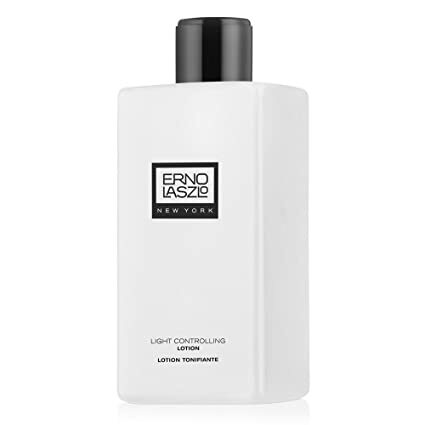 Erno Laszlo’s original controlling preparation reduces surface oil and refines your skin to eliminate dullness for fresh-faced results. Anti-inflammatory botanicals calm irritation and stimulate tissue repair. Illuminate your delicate eye-area skin with a detoxifying gel to brighten dark circles and reduce puffiness. This refreshing eye treatment is packed with botanical extracts to deliver visible results. It dramatically reduces puffiness to eliminate tired looking eyes, and improves elasticity for firmer, stronger, younger looking skin. This weightless, non-greasy daily moisturizer combines with broad-spectrum UV protection to soften and soothe the skin. Filled with essential vitamins, it deeply hydrates, softens and repairs the complexion while reducing fine lines and wrinkles. SPF 15 prevents photo damage to maintain healthy, glowing skin properties. Calms inflammation and irritation with antibacterial properties.